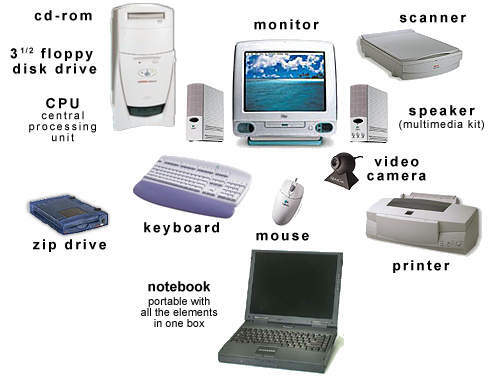 The hardware are the parts of the computer itself including the Central Processing Unit (CPU) and related microchips and micro-circuitry, keyboards, monitors, case and drives (hard, CD, DVD, solid-state (ssd), floppy, optical, tape, etc...). Other extra parts called peripheral components or devices include mouse, printers, modems, scanners, cameras and cards (sound, color, video) etc... Together they are often referred to as a personal computer. In the section we will cover some hardware and the more common used peripheral components as they relate to helping you learn more about computers and how they function. 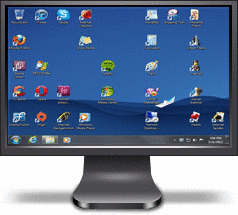 Scanners- Scanners allow you to transfer pictures and photographs to your computer. A scanner 'scans' the image from the top to the bottom, one line at a time and transfers it to the computer as a series of bits or a bitmap. You can then take that image and use it in a paint program, send it out as a fax or print it. With optional Optical Character Recognition (OCR) software you can convert printed documents such as newspaper articles to text that can be used in your word processor. Most scanners use TWAIN software that makes the scanner accessible by other software applications. With advancement in technology, it is more common today to find an All-In-One machine that is a stand alone unit. 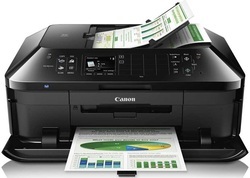 This simply means that the printer, scanner and fax are combined into one device. ﻿Digital cameras allow you to take digital photographs. 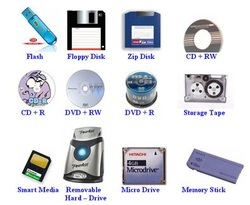 The images are stored on a memory chip or disk that can be transferred to your computer. Some cameras can also capture sound and video. Camera Phones are another means of taking digital photos (and usually video as well). The majority of mobile phones in use today are camera phones. 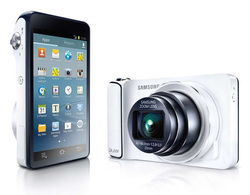 Most camera phones are simpler than separate digital cameras. The camera features are an integrated part of the the cell phones, and have limited features as compared to digital cameras. Removable Storage and/or Disk Drives - All disks need a drive to get information off - or read - and put information on the disk - or write. Each drive is designed for a specific type of disk whether it is a CD, DVD, hard disk or floppy. Often the term 'disk' and 'drive' are used to describe the same thing but it helps to understand that the disk is the storage device which contains computer files - or software- and the drive is the mechanism that runs the disk. The two major components in a small computer network are a modem (cable or DSL) and a wireless router. The router is wired to the modem, and the modem is wired to the cable company's coaxial cable or the telephone company's DSL phone line. For Internet access via satellite, the router is wired to a satellite modem. The modem establishes and maintains the connection with the Internet provider's service and converts the signals from and to the router appropriately. The router forwards traffic destined for the Internet to the modem, while keeping internal traffic (computer to computer, computer to printer, etc.) from leaving the network. Using assigned numbers, the router keeps track of which computer made a request to the Internet in order to send responses back to that computer only. A wireless router is a device that performs the functions of a router but also includes the functions of a wireless access point. A wireless router is commonly used in the home and small business, which adds other functions such as wireless printing and more..